Ousted Iraqi President Saddam Hussein is in custody following his dramatic capture by US forces in Iraq. "Ladies and gentlemen, we got him," US administrator Paul Bremer told journalists in Baghdad, to loud cheers from Iraqis in the audience. 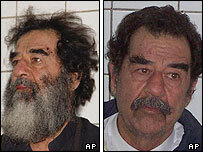 Saddam Hussein was found in a tiny cellar at a farmhouse about 15km (10 miles) south of his hometown Tikrit. Saddam Hussein, 66, was the most wanted man on the list issued by US authorities but had not been seen since Baghdad fell to US forces in April. Video footage released by the US military showed a dishevelled-looking Saddam with a long black and grey beard in custody receiving a medical check-up. President George W Bush is due to speak about the arrest in an address to the nation from the White House at about 1700 GMT. Saddam Hussein had been the object of intensive searches by US-led forces in Iraq but previous attempts to locate him had proved unsuccessful. 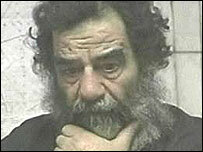 US officials said Saddam Hussein was co-operative after his capture and talking politely. People have started celebrating the capture of their former president in the streets of Baghdad and the northern Iraqi city of Kirkuk by sounding their horns and firing into the air. US authorities had offered a $25m reward for information leading to his capture. Meanwhile, violence continued in Iraq on Sunday, with at least 17 people killed and 30 wounded after a powerful car bomb exploded at an Iraqi police station in Khaldiyah, about 35 miles (60 km) west of Baghdad.